There are plenty of stocks I'd love to get my hands on. These two don't represent any of them. One of the greatest strategies for investors is cultivating a watchlist. Personally, keeping a list of stocks under constant supervision has mitigated the probability that I'll overreact and execute trades on a whim, without investigating them adequately. In all likelihood, some stocks may never make it off the list. For example, as much as I'm rooting for Tesla to succeed in reimagining the transportation landscape, the stock has remained on my radar for years -- never the subject of a buy order -- and I realize it may linger on said watchlist indefinitely. I don't intend to add gold exposure to my portfolio anytime soon. But if the urge to rush into a gold stock surfaced, I'm sure that IAMGOLD would not receive the nod. With, arguably, one of the strongest balance sheets among its gold-mining peers, IAMGOLD certainly deserves respect. But that's hardly a reason for it to earn a place among my holdings. Actually, I'm not too enthusiastic about gold miners in general, since they often underperform the overall market. In IAMGOLD's case, it hasn't only underperformed the S&P 500 over the past 10 years, it has also failed to keep pace with the price of gold. One of the most troubling aspects of IAMGOLD is the high cost which the company requires to dig the yellow stuff out of the ground. In fiscal 2016 and 2017, the company reported all-in sustaining costs (AISC) per gold ounce of $1,057 and $1,003, respectively. In regards to its portfolio, the company operates four mines on three continents, representing a fair degree of risk since complications at one of mines could wreak havoc with the company's financials. This, moreover, impedes the company's ability to achieve economies of scale thus improving its gold margin. It would take many years for the company to develop a large and well-diversified portfolio -- time which I'm not willing to wait. Also of concern is the fact that the company is a pure-play in gold. 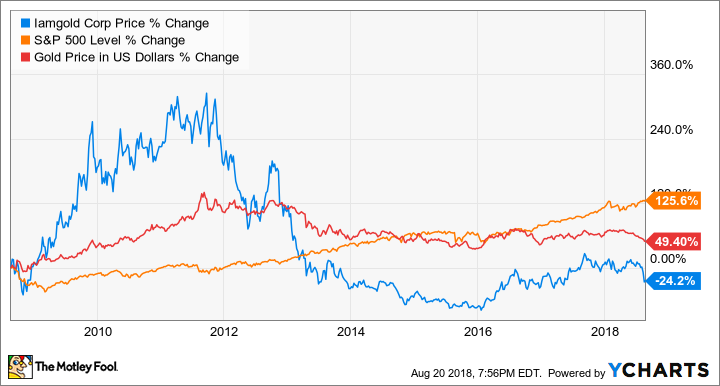 Since the company primarily generates revenue from the production of one metal- and doesn't seem motivated to diversify its revenue stream in the future -- a sharp downturn in the gold market could be disastrous. One of only a few fuel cell technology options for investors, FuelCell Energy focuses on the development of stationary power fuel cell projects for customers ranging from utilities to universities. The company, however, has faced a persistent uphill battle in convincing customers that its solutions represent a viable option to conventional power sources despite support from the government, which came in the form of the investment tax credit. Since 2013, when it reported revenue of $188 million, sales have steadily declined in each year, resulting in a top line of $96 million in 2017. The company's competitors, on the other hand, have achieved great success in growing sales over the same period of time. Over the past five years, Plug Power (NASDAQ: PLUG) and Ballard Power Systems (NASDAQ: BLDP) have grown revenue at compound annual growth rates of 32% and 22%, respectively. Unlike Plug Power which is expanding beyond its core business, material handling equipment, into other markets like airport ground support equipment and electric vehicles, and Ballard Power Systems which provides its fuel cells for use in trucks, drones, and numerous other applications, FuelCell Energy remains primarily focused on stationary power, leaving me less than charged up about the company's prospects to diversify -- and grow -- its revenue stream in the future. Besides fuel cell companies which directly compete with FuelCell Energy, like Bloom Energy, there will also be consistent formidable competition from companies providing solar power and wind power solutions as greater advances in these two technologies yield greater reductions in costs. For a variety of reasons, therefore, FuelCell Energy is surely one name which won't find itself in my portfolio in the foreseeable future. For a variety of reasons, I know that IAMGOLD and FuelCell Energy will never make it onto my watchlist, let alone into my portfolio. IAMGOLD, for some, may represent a glittering opportunity, but its track record of underperforming the market, lack of geographical diversity in its portfolio, and dependence on a strong gold market don't seem very alluring in my opinion. And while I hope FuelCell Energy succeeds in helping customers transition away from conventional power sources, I believe the company faces a fierce road toward sustained profitability; consequently, I'll happily watch from the sidelines as the company's story unfolds.